:Everything that God does is characterised by His infinite skill. In this book the author shows that the Word of God demonstrates beyond all shadow of a doubt the design of its perfect plan. In The Structural Principles of the Bible, the words of the Bible are seen to be living in their essence, and life-giving in their ministry. ""Structure"" indicates that which go to make up the whole. ""Principle"" speaks of the law which governs the making of anything. F E Marsh shows how to apply these principles in the study of the Word of God in order to enrich the life of the reader. 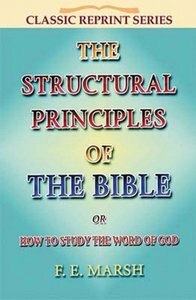 About "The Structural Principles of the Bible (Classic Re-print Series)"